Ahead of the new season, Pollok are delighted to announce the signings of ‘keeper Scott Johnson and defender Tony Coutts on dual contracts for the 2018-19 season. The players, both products of the youth academy, rejoin the first team after being part of the squad in the second half of last season. Scott Johnson made his debut for Pollok in the January Scottish Cup win away to Rossvale, keeping a clean sheet in the process. He went on to make another 7 appearances for the first team as cover for the injured Jordan Longmuir. Tony Coutts is yet to make an appearance for the first team but served last season as captain to the league winning Under 19’s side. The players join academy graduate Mohamed Niang in the squad for the forthcoming season. 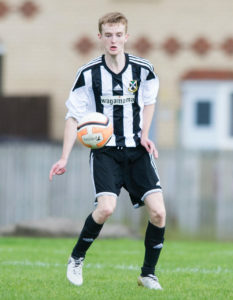 Pollok are delighted to announce that Nathan McGarvey and Tony Coutts have joined the first team squad from Pollok Under 19’s. They join fellow academy players Mohamed Niang and Scott Johnson who have both made first team appearances this season. 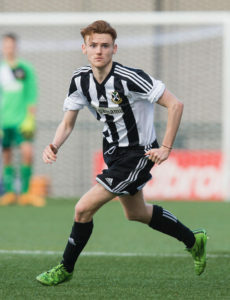 Coutts, a central defender and McGarvey, a midfielder, are integral parts of the 19’s squad and will join up with the first team squad for the remaining league games and West of Scotland and Central cup campaigns. 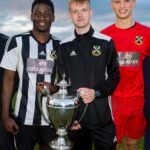 In the summer of 2017, Under 19’s captain Mohamed ‘Sena’ Niang initially signed on a dual contract and made his Pollok debut in the Sectional Cup win against Arthurlie in August. He has since made nine league appearances and two cup appearances. ‘Keeper Scott Johnson made his Pollok debut earlier this year in the Scottish Cup win against Rossvale, keeping a clean sheet in the process. He also made his league debut in the recent draw with Beith. In other news, goalkeeper Derick Moore, who had been loaned to Maryhill, has been released by the club.